Sometimes I step back and shake my head at how I've become a completely stereotypical Asian mom. I expect academic excellence and make my kids learn both the piano and violin. Completely textbook! But not only do I make my kids practice, I jump right in myself, taking the tiger mom role to the extreme. And just to be clear, there is NO TIGER BLOOD in this tiger mom as opposed to Mr. Sheen. So how do I jump right in? Since I don't play the violin, I also take lessons myself. I am learning the Suzuki method along with the kids, drinking and living the Suzuki kool-aid, and practicing Every. Single. Day (hence the drop off in blogging - I should be practicing right now). The fact that I am learning along with them is actually unbelievably helpful. Part of the Suzuki brainwashing is listening to the Suzuki recording so that you hear what the pieces sound like. 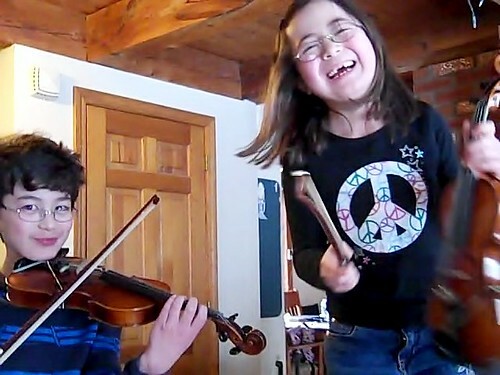 We only really listen to the music in the car on the way to violin lessons, but the kids actually hear me practice the pieces ad nauseum before they learn them. First I learn a piece (thankfully at this point, I am still ahead of them), then a few weeks later, Adam will learn the same piece, and a few weeks after that, Dova will learn the piece. By the time Dova gets to it, she's heard it so many times, that she has it completely memorized by ear and it is really easy for her to learn. Check out them out playing Bach's Minuet No. 2. Not perfect of course, it's only a practice session. And Dova is precariously standing on a chair, oh well. Since I'm in the trenches, it wouldn't be fair if I didn't post a video of myself as well. Here I am playing the fiddle piece Devil's Dream (oh no, I've veered off the Suzuki course!). Adam heard me practice this so much that he picked it up by ear as well. Here he is effortlessly pulling it off while Dova pretends to play along. OK Dova, you need to GET OFF THE CHAIR!!! Adam will be better than me in no time. I just wasn't expecting that to happen within the first year. And being in the trenches doesn't only apply to the violin. Since the kids have to perform in numerous piano recitals, it is only fair that I have to perform on the piano as well. Recently, I auditioned for a local talent show. I wanted to show the kids that I still get nervous and push myself outside of my comfort zone. I haven't performed solo on the piano since I was 16 years old. It's time to Susan Boyle it! Here is a practice session of the piece that I will be performing in the talent show next month, Edvard Grieg's In the Hall of the Mountain King from the Peer Gynt Suite. The kids have always loved being crazy when I practice this piece, so I've named this video, Hall of the Mountain Children. Do you suppose my kids are benefiting from me being in the trenches with them, or am I totally insane? I've been taking drums for 2-3 years and my son just started lessons as well with the same teacher. I didn't realize that was Tiger Mom, I just thought we were having fun! All kidding aside I actually do think it helps. It's motivating by inclusion.